Gantry crane is bridge crane mounted on legs that run along a set of fixed rails or similar track. The term is also applied to portable bridge cranes that are set on wheels or other rollers. Gantry crane can deal with lifting work both indoors and outdoors well. 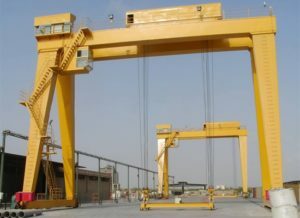 Gantry crane has wide application. It can be used for indoor and outdoor work. 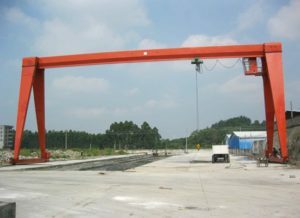 According to the shape, gantry crane includes U-type crane, A-leg gantry crane, L type gantry crane. For the girder number, gantry crane mainly has two types, single girder gantry crane and double girder gantry crane. 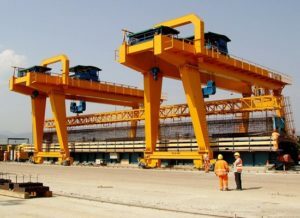 For the girder type, it has box type gantry crane and truss type gantry crane. Which one is suitable? This is influenced by practical needs. For light and frequent lifting work, small and single girder gantry crane is suitable; for heavy transporting work, large and double girder crane is reliable. 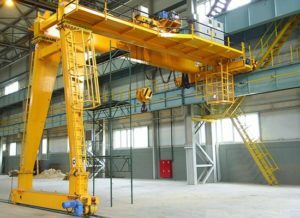 To get a suitable gantry crane, many factors should be considered, such as power delivery, indoor or outdoor use, nearby foot or motor traffic, fixed axle or rotating axle end trucks, crane speed. Don’t worry! Our company provides customized service to ensure suitable crane for every consumer! To make sure reliable performance, the users should take day-to-day inspections before the beginning of a shift or before using the crane for the first time each work day. Inspect the wire rope for abnormalities or damage. Inspect the drum for proper rope alignment. Inspect the area around the machine for any indication of leaking or dripping fluids. Inspect the block and hook for any cracks or damage. Visually inspect any bumpers for damage or abnormalities. Visually inspect Limit Switches for abnormalities and test for proper functionality. 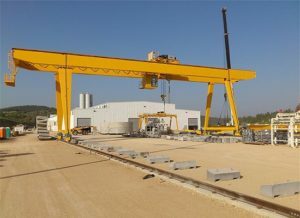 Contact us for AICRANE gantry crane!